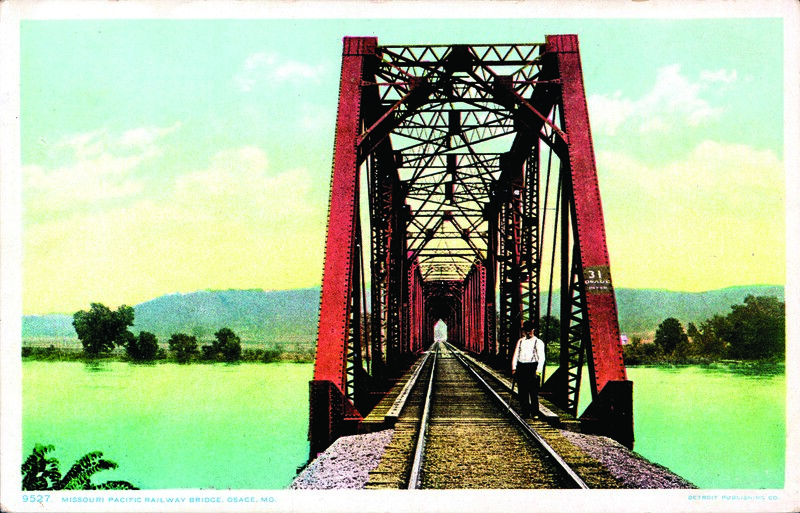 The original iron truss railroad bridge over the Osage carried traffic only one direction at a time, making trains wait for others to cross before proceeding. The center span once could be raised to accommodate steamboat traffic. 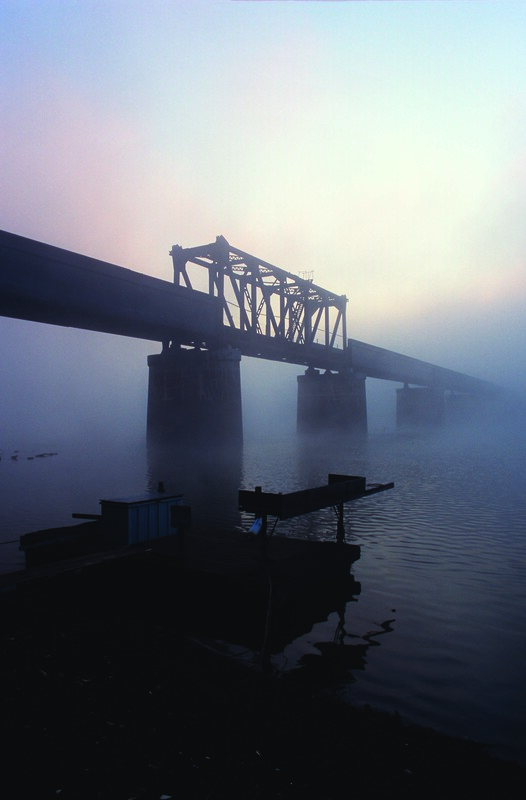 This image of the original bridge was taken in 2010. (page 73, Damming the Osage). An aerial photo from the Missouri Department of Transportation shows the new span being built next to it. In the push westward a hundred or more years ago, avenues of transportation for people and products were explored, promoted and built. Jumping off points to the opening West included Osceola and St. Joseph as well as Westport (Kansas City) Missouri. 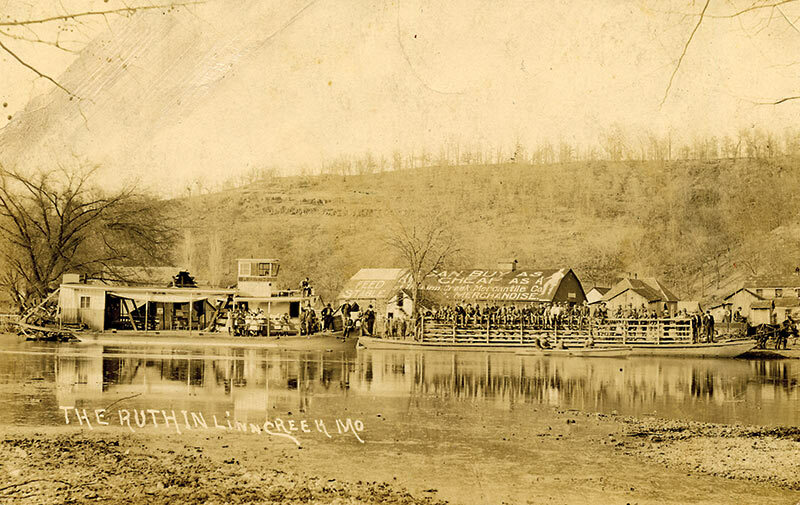 Local promoters sought improvements to the Osage for steamboats like the ill-fated and ill-purposed Lock and Dam No. 1. The rocky hills and narrower alluvial valley of the Osage River precluded railroad construction for the most part. But railroads overcame steamboats as efficient movers of goods and immigrants. The alluvial plain along the Missouri River was broad enough to allow for building tracks and the link from St. Louis to Kansas City made the straightest route. 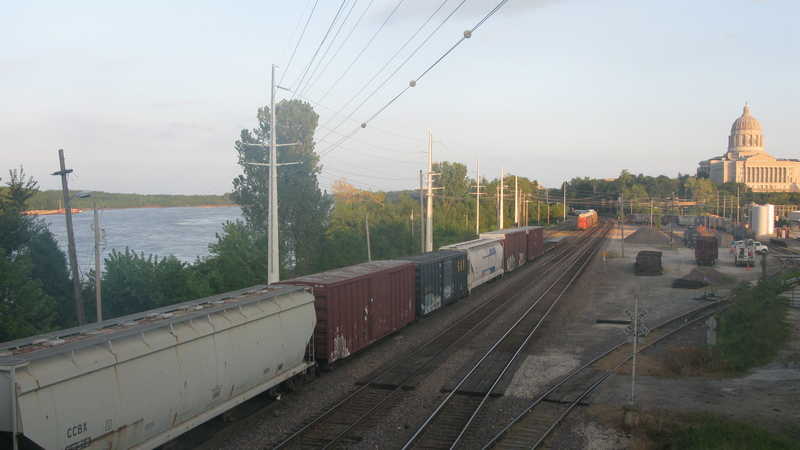 That same route today carries 60 daily freight trains and Amtrak’s Missouri River Runner between the two metropolises. Local plans for improvements to the Osage River to make it a commercially navigable stream projected a series of locks and dams. Work by the Corps of Engineers on the first one began in September 1895 at Shipley Shoals, then seven miles from the mouth of the Osage. A key feature of the project was the “Chittenden Drum Wicket” (or the Chanoine wicket), the half-round section shown in this diagram. Designed by Army Corps Captain Hiram Martin Chittenden to regulate the flow of the river, the retractable 375-foot long iron mechanism was installed on top of a 9-foot concrete dam. It was prone to being jammed by mud and clogged by drift and was eventually scrapped. Soon after its completion in 1906 a 30-foot section of the dam collapsed. That was rebuilt and for more than a century the lone lock and dam has served more as an impediment to river travel than as an improvement. Capt. Chittenden redeemed himself with the Chittenden locks in Seattle, a complex of locks at the west end of Salmon Bay, part of Seattle‘s Lake Washington Ship Canal. Chittenden became the Seattle District Engineer for the Corps soon after completion of Lock and Dam No. 1. Seattle’s locks include working fish ladders for salmon. They were formally opened in 1917 and are still in operation. Chittenden retired as a general. Possibly he erred in his calculations for Lock and Dam No.1 because he was absorbed in the writing of multi-volume books on the fur trade in the West and on steamboating on the Missouri River. Remarkably, unlike other histories written in that era, these are still in print, and even available in e-book format. His guidebook to Yellowstone is also still in print.